England International Bradley Gibbons reports back from the annual Paul Glenfield River Thames Festival held in Oxford. The event has rapidly grown in popularity amongst match anglers and now accommodates nearly eighty (80) individuals, including some of the finest river anglers in the country. 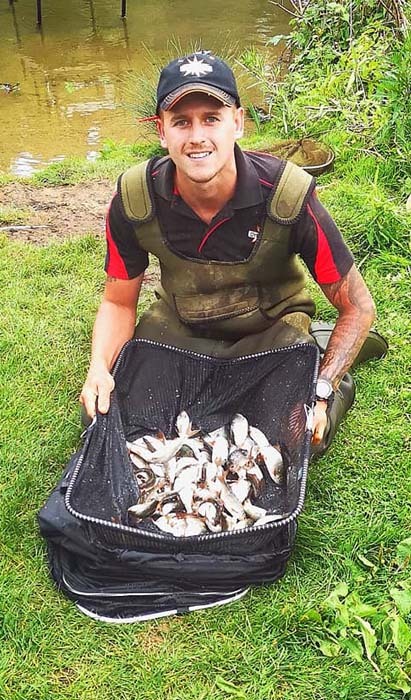 Anglers are pegged across three sections held at Abbingdon, Cullham and Appleford with angler’s required to fish each section across three days. The event is decided by way of points with weight being the determining factor should any anglers tie on weight. This year’s festival produced some superb sport with very little separating competing anglers after the three days. Brad looks back on what was a festival of mixed fortunes, but one that saw him finish in the main frame. “The opening day of the festival saw me pegged at Cullham. It was a strange sort of a day but managed a final 12lb 3oz of roach fishing maggot at 13m on the pole and casters over groundbait”. “Groundbait mix for the day was a single bag of Dynamite Frenzied Hemp Black, one bag of River and two bags of Dynamite Roach mixed with three litres of soil“. “This was good enough to secure me an all important section win on day one, so I was keeping my fingers crossed for a decent draw at Appleford“! “Day two saw me pegged on C9 at Appleford. I wouldn’t go as far to say that the wheels fell off, but one of them did at least! I managed 6lb 8oz of roach mainly over groundbait with a few better quality fish on hemp. This was only good enough for fifth in my section and a limp handshake“! “Going into the final day, I was still confident of a place in the main frame however, providing I got a decent draw at Appleford. It’s just a shame I wasn’t able to find more better quality roach on my hemp line, but it wasn’t to be. Looking back, I felt like I hadn’t fished the right match with my peg being worth at least 8lb, which would have seen me finish third in section“. “The final day of the festival saw me draw peg 13 and I really fancied it for a few fish. I managed to catch 8lb 10oz at 13m on the pole loose feeding casters over groundbait. This won the whole of my section up until the two pegs at the cricket pitch, where weights of 15lb and 20lb had been recorded with Tom Hobbs winning the section from peg 1“. “I have to say the Signature range of floats I used were absolutely brilliant! I used the lighter Series 3 pattern on my caster and maggot lines; the Signatures series 4 in 0.5g on my strung out hemp rigs; and the heavier Signature Series 3 on my groundbait rigs. Choice of line throughout was the new MV-R rig mono in 0.14mm used with 0.10mm MV-R hooklength mono“. “Overall in the festival I finished with ten (10) points over the three days, which saw me finish in eighth place, just inside the main frame finish. Such is the standard of fishing on the Trent at the moment, combined with the calibre of angler competing, my ten (10) point score saw me tie with four (4) other anglers. Unfortunately for me, my cumulative weight let me down and I had to concede on weight to all four them, which saw me fall down the leaderboard a little“. “Still, the festival was brilliant as always and extremely well run by everyone involved! Big well done and thank you to Paul Glenfield, Jo, John Beesley, everyone who put the hours in cutting the pegs out, all the sponsors and Jay Proctor and Monty for weighing in“! “Regardless of how the fishing is, this is one festival that I look forward to each year purely for the group of anglers you fish with! Lovely bunch of people from all over, young and old“! “Looking forward to it next year again“!